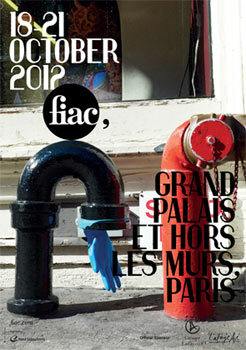 The 39th edition of FIAC will take place from 18 October to 21 October 2012 at the Grand Palais in Paris. All FIAC 2012 exhibitors will show within the majestic landmark of the Grand Palais which incorporates, for the first time, the newly renovated Salon d’honneur, historic heart of the architectural ensemble formed by the Grand Palais. The nave and the Salon d’honneur will house galleries specializing in modern and contemporary art. Level +1 will host contemporary art galleries, galleries representing the emerging art scene together with the Lafayette sector. 178 galleries representing 24 countries will exhibit at FIAC 2012. FIAC and the Groupe Galeries Lafayette are proud to announce the fourth consecutive edition of the Lafayette Sector, an ongoing programme launched in 2009 in the context FIAC’s partnership with the Groupe Galeries Lafayette, Official Sponsor of FIAC. This programme underlines the joint desire of FIAC and the Groupe Galeries Lafayette to provide tangible support to the actors of the emerging art scene in its international dimension. The Lafayette Sector provides financial support to 10 French and international galleries presenting emerging artists. Participants are selected by an independent jury of international curators. Guillaume Houzé (Art Patronage Director, groupe Galeries Lafayette, Paris), Jean de Loisy (President of the Palais de Tokyo, Paris), Sandra Terdjman (Kadist Art Foundation, Paris), Stefan Kalmár (Artists Space, New York), and Alessandro Rabottini (GAMEC, Bergame) constitute the 2012 jury. FIAC 2012 reinforces the development of its off-site exhibitions program, Hors les Murs: in partnership with the Domaine national du Louvre et des Tuileries, a major ensemble of outdoor sculptures and installations will be presented in the Tuileries Garden. FIAC is equally proud to present an off-site exhibition focusing on the theme of nature, biodiversity and the environment in the unique indoor and outdoor venues of the Museum National d’Histoire Naturelle, Jardin des Plantes (Natural History Museum & Botanical Gardens). Additionally, the Hors les Murs programme will be expanded to include a presentation of large-scale outdoor sculptures in the Place Vendôme, in collaboration with the Comité Vendôme and its members. Artist’s films and performances programme will be presented in the Auditorium of the Louvre Museum, the Auditorium of the Grand Palais and the Cinéphémère, with the support of the Fondation d’entreprise Ricard. In addition, FIAC week will once again be marked by a wealth of artistic and cultural events organised by galleries, museums, institutions, collectors and patrons of the arts. FIAC is owned and organized by Reed Exhibitions.